When trying to create your own shopify store it’s great to find out what WORKS! You can use our Sellslikehotcakes best seller finder tools or do your own research. Today I have a great finding for you, as example. (I am not affiliated with this store and just found it yesterday). I use it as an example of successful campaign. 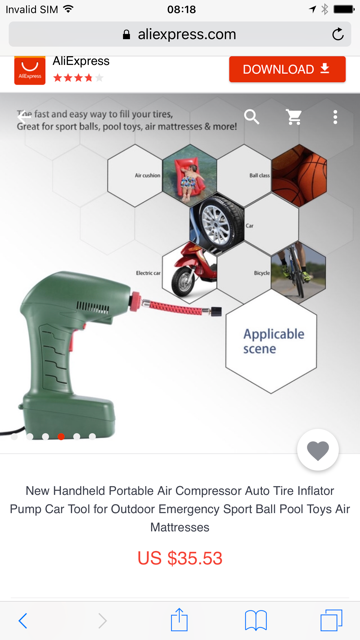 It is selling an electric handheld pump for a car. 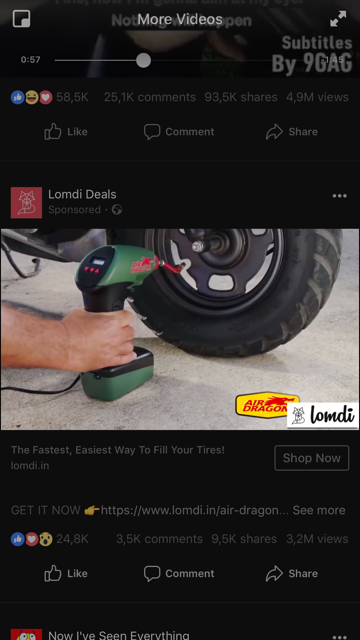 This is their sponsored ad, well made video with a big amount of comments and likes. 24.5k likes? not bad. No surprise it got many comments and shares. and if you check their offer, they are selling the electric pump for a crazy price of 87 usd! Even going as far as saying it was 300 usd (lol) before for a good scarcity “SALE” effect. Obviously the source product is much cheaper and using Sellslikehotcakes research tools we can easily find it on Aliexpress for just 35 usd. So in case they use dropshipping model their profit is around 52 usd per unit (!) Amazing ! If they use the whitelabelling (most likely by putting the Dragon logo on it) they get even better prices. 3-8 usd per unit with 2000 units minimum. Add shipping and FBA fees and you get around 15 usd cost per unit with the sale price of 87 usd 🙂 Not bad, huh? Now your profit margin is crazy 72 usd ! So you can see how well you can get started with dropshipping using a simple viral idea, playing on the passion and the need instead of trying to sell generic products like necklaces or t-shirts! If you have not started, I hope you get started soon, and get your store going for the coming-soon Halloween and Christmas sale!! I'm new here but really LOVE the course and the all the detailed info so far!! You guys have been really helpful to me! What tools do you use to count your fees? Check Fetcher, CashCowPro and tools like that! Hope it helps! They connect directly to your amazon seller-central to fetch data and build a nice stats&charts&fees page. OMG!! today i see ... part of my inventory seems missing? what to do? Go to Inventory > Manage FBA Shipments and check if they were received correctly by warehouse? if not, file a report and amazon will research and investigate and credit you for missing or lost units. Finally, check to see if there have been any recent inventory adjustments by using the Inventory Adjustments Report and check to see if there are any ongoing warehouse transfers using the Inventory Event Detail Report. Business registration in an EU country or company in EU, VAT registration in every country where your inventory is held, (usually its UK, Germany, France, Italy, Spain, Poland, and the Czech Republic) Also need CE certification. then you do in future also Annual income tax filings in your EU registered country, Monthly VAT filings in your registered countries, Annual, quarterly, or monthly filings of your activities with Interstat (the frequency depends on your sales volumes), A continuous customs bond for Schengen countries. Continuous customs bonds for non-Schengen countries (basically the UK). There are companys that handle all that paperwork like FBA-Hero, check resources sections..
Hi there! I'm new here and preparing to ship first set... What is the max box size I can ship to the warehouse? Dont put over 150 units of product in a single box! Any good freight forwarder to help me ship? @Vlad Try flexport..Full-service air and ocean freight forwarder providing visibility and control over your entire supply chain through software.. When running a promotion, what is the recommended discount for the sale to count as a verified review and feed the amz algorithm? Amazon does not reveal exact cutoff data for "verified" vs "unverified". some people say it's 50% but it's a wild guess. It does not matter really. Don't overthink it Father. I give minimum of 80% off. Keeps buyers happy and many reviews coming (WITHOUT asking even with new policies all ok). wow this is helpful one, thx!! hi guys! great to see you are all crushing it. Any help would be really appreciated.. How can I ship Fedex DHL from ali without killing the bank? Welcome to community! You will love it here! Regarding your question - Make a deal with your supplier or get your own Fedex and DHL account. Usually a big factory that ships a lot get special deals and lower rates on shipping. What fullfilment services you use? Try Shipwire to ship to US customers and across Canada, shipwizmo.com, maybe even Fulfilled by Amazon? Also ZhenHub they have fulfillment centers around the world - China, USA, UK, Germany, Australia. What should I put as the "Ship From" address in seller central when I'm building the out the shipment and the carton labels? And how do I determine which fulfillment center to ship to? I think the big concern is shipping times for dropshipping with Shopify. Anyone that have more experience in this concern...please give me for advice. Thanks!! Here is a new video i added "I don’t have TIME! + surprising ending" to address the most common question I get "I don't have enough time!" "I don't have time to learn!" "I dont have time to watch 12 hours of videos!" I dont have time to research a product!" "I dont have time to find a supplier" I dont have time to open my own ecommerce store!" Just about ready to go here ..... I am getting my logo done and plan on going live this weekend. Of course do! We'd love to post some thoughts and feedback! And Good luck! Do you know number 1 reason most people fail in ecommerce? It's because they never get themselves a chance, they never get started, always procrastinating and delaying the start. I get questions and complains like "I don't have time for this", "How much time do I need?" Well if you can't even find time to learn how are you supposed to build your passive income? The beautify of Amazon and Shopify business is that once it is set, you are set "for life" with a strong passive income. The problem? Most people don't realize it and never start! So the hashtag for the day - TAKE ACTION! Start implementing what you learned and you will become successful, I believe in you! Wow well said Wade. I went through similar hardships when starting out... What if people don't buy my product? What if it's too late? But then again what do I have to lose? It's not like i am investing 100,000 into this. Good Luck Wade! You are on the right track just by giving it a try. 99% of people fail because they never start and give it a chance. how much should i charge for international shipping for "free + shipping offers"? If a client buys a "free+shipping offer" directly from my site more than once - how much should i charge for every "free+shipping item" added?